In February of 2014, just six years after Russia invaded Georgia with heavy tanks, the world watched aghast as it brazenly occupied Crimea with light armored infantry. Though relatively few in number, the sudden act of aggression effectively allowed Moscow to seize key terrain on the Black Sea with ominous strategic implications before the West could intervene. Since then the former Soviet empire has continued to destabilize Ukraine with an insidious, hybrid military campaign as NATO has, at times, appeared unable to prevent the expansion. However, over the past two years, the United States and Europe have been responding with increasing decisiveness as they deploy a series of combined arms task forces — in concert with ongoing strategies to politically and economically isolate the aggressor — to partner in former Eastern-bloc countries. As directed in the 2014 Army Operating Concept, this positioning is allowing operational potential to maneuver “dispersed over wide areas” and “develop situational understanding through action while possessing the mobility to concentrate rapidly.”1 If the Russians initially gained the military-political initiative through preemptive positioning of imposing forces in Crimea, the West is responding with similar boldness across Eastern Europe on a larger scale. Bulgarian and U.S. 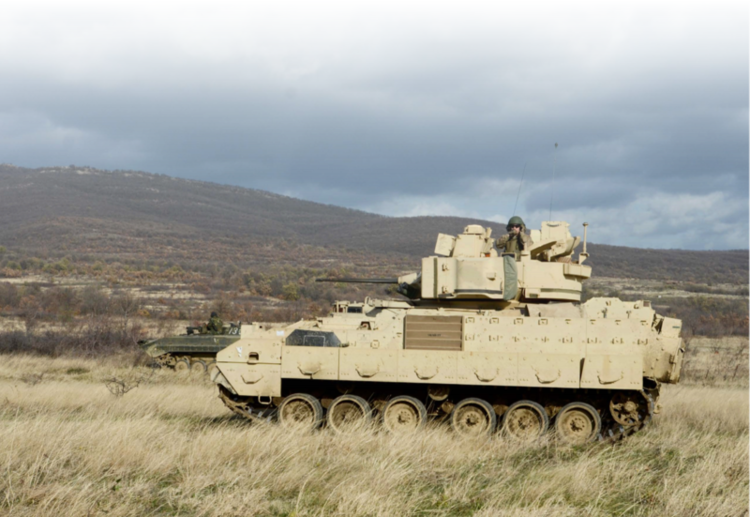 Soldiers conduct an offensive movement with a Boyevaya Mashina Pekhoty 1 (BMP -1P) and a Bradley Fighting Vehicle during Exercise Peace Sentinel at Novo Selo Training Center, Bulgaria, on 22 November 2015. Brigades containing a versatile panoply of mechanized battalions — all armed with large-caliber weapons, protected by armored hulls, and propelled through difficult landscapes by tracked mobility — wield combinations of lethality, survivability, and maneuverability unmatched in land warfare. Brigades containing a versatile panoply of mechanized battalions — all armed with large-caliber weapons, protected by armored hulls, and propelled through difficult landscapes by tracked mobility — wield combinations of lethality, survivability, and maneuverability unmatched in land warfare. Even as they hold immense capacity to defend against enemy attacks, armor-centric task forces possess an ability to unleash devastating firepower against opponents as they synergize efforts with wheeled, airborne, and light infantry components. It is no coincidence that the very territories that were once the scene of epic armored clashes between Nazi and Soviet armies during World War II, including Crimea, have again emerged as sites of relative maneuvering by NATO and Russian heavy forces as they jockey for positional advantage. These singular qualities justify why the United States’ decision to deploy highly lethal combined arms and coalition contingents not just to Germany, but across Eastern Europe, has served as an effective and enabling military component to NATO’s larger political strategy to block Russia. It empowers allied commanders with capacity to, as required by U.S. Army doctrine, “prevent conflict, shape the security environment, and win wars” through “joint combined arms operations.”4 Moving beyond tactical equations, the messaging to both allies and opponents is clear: America has rejoined the game. 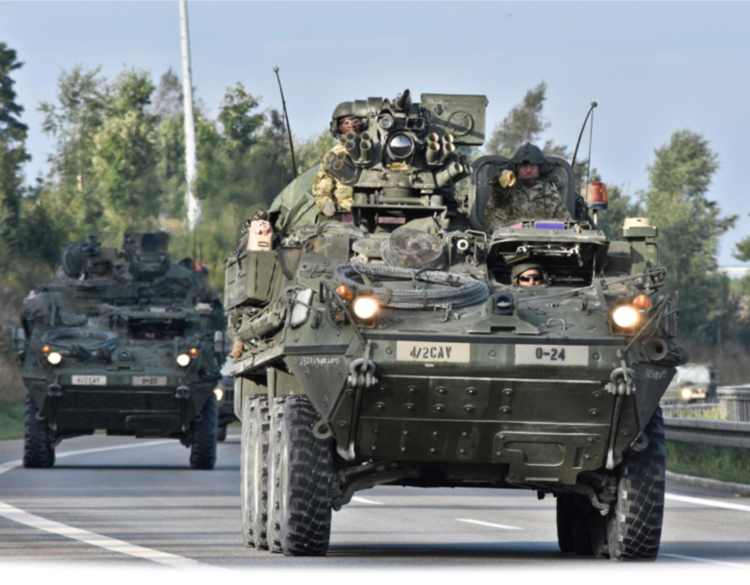 Reversing recent trends of reducing the U.S. Army’s fighting ground presence in Europe to less destructive wheeled and airborne units, the return of American mechanized forces to the former theater of Cold War confrontation definitively communicates strength of national will. This tangible statement of martial resolve — when employed to encourage political and economic unity amongst NATO participants — holds immediate potential to bolster allies and intimidate opponents. Falling under the Army competency of wide area security, it is defined as “the application of the elements of combat power to protect populations, forces, infrastructure, and activities to deny the enemy positions of advantage and to consolidate gains in order to retain the initiative” while providing “the joint force commander with reaction time and maneuver space.”5 On one hand, large countries like England, Germany, and Poland — in addition to other smaller and more vulnerable states in Eastern Europe — will be reassured by America’s deliberate stand against Moscow’s subversive designs. On the other, the revanchist Russian empire will find itself strategically frustrated, or at the very least operationally blocked, from further military expansion without a risk of greater cost. This combined arms positioning consequently offers both risk and reward for the NATO coalition as it projects forces into once unthinkable arenas. While the Russian government will not openly assault American capital assets lest they provoke a major conflict, hybrid attacks or non-state interference will likewise fail to achieve meaningful impact so long as partnered forces avoid compromising exposure in peacekeeping operations. Though no operation is ultimately predictable — and it is possible that Moscow will respond by socially, economically, and politically destabilizing partnered nations by inciting ethnic Russians or other disaffected populations — Atlantic Resolve is emerging as the most serious, but scalable, option for facilitating Western military involvement without provoking kinetic confrontation. America’s leading role in NATO’s plan to establish contingents across Eastern Europe contains additional nuance. By dispersing only limited U.S. forces with relatively small “activity sets,” European host nations and Western contributors are compelled to contribute significant ground units to each coalition task force instead of relying on American largess. Never intended to match the much larger Russian army tank-for-tank or threaten massive invasion, the concept allows an economized and invested alliance to physically and physiologically secure territory in a chess match of strategic posturing. By proactively occupying ground, just as Russia did with Crimea, allied forward positioning severely limits opposing military options without risking expensive escalation with all of the involved nations. Despite the United States’ laudable decision to place coalition detachments across Eastern Europe on a rotational basis, the current operation may prove only an initial step towards countering the Russian challenge. If interference in Ukraine continues, further action may be warranted and justified. To that end, the United States should consider a highly visible and publicized return of permanent mechanized forces to Europe. At a minimum, this should include re-stationing a full division headquarters and an armored brigade combat team of approximately 4,500 Soldiers and heavy equipment in Germany. Resourced to “execute operations with shock and speed” while providing “tremendous striking power,” as defined by FM 3-90.6, Brigade Combat Team, the ABCT’s complement of mechanized infantry, main battle tanks, self-propelled artillery, heavy cavalry, and tracked engineers make it the premier forcible entry formation for joint forces in potential major combat operations in Europe. This type of enduring deployment to a forward theater would incur both controversy and applause. While the decision would markedly increase fiscal costs and compel difficult domestic political choices when choosing which Army post in the United States would produce the required structure, the potential arrival of units like the 1st Infantry Division, 1st Armored Division, and 3rd Infantry Division —storied commands who famously defended Europe during the Cold War — would offer both practical and nostalgic appeal. Similar to deterrent effects won by the U.S. Army’s long-term, if slowly dwindling, commitment of permanent forces in the Republic of Korea, this partnership would reflect a normative and historically successful option in American foreign policy. While stationing heavier forces in Germany offers a familiar and proven approach, it still may not be enough. If Russian belligerence continues, America and NATO should consider the heretofore unthinkable: the establishment of a larger and semi-permanent joint combined arms task force in Poland under legally sanctioned status. While such a force would inevitably be centered on combined arms battalions of mechanized infantry and tanks with unmatched capacity for mobile protected firepower, it would also include, in order to possess maximal combined arms potential, task-organized lighter infantry, special operations forces, and attack aviation assets. Soldiers with the 4th Squadron, 2nd Cavalry Regiment maneuver their M1126 Stryker Combat Vehicles on 13 September 2015 during Dragoon Crossing, a tactical road march that started out at Rose Barracks, Germany, continued through the Czech Republic and the Slovak Republic, and ended in Hungary. This forward positioning, which would complement smaller rotational NATO contingents along Moscow’s periphery, would enable a highly mobile and potent allied force to foster enhanced partnership with a sovereign ally in acute proximity to Russian territory. More importantly, the logistical footprint required to support a robust combat unit with their uniquely diverse armament of Infantrymen and heavy weaponry would facilitate, and telegraph, the possibility of follow-on NATO forces should further involvement or scalable strategic maneuvering be required. Despite these implications, the presence of a brigade-sized task force would not threaten territorial invasion of Russia and thus communicate only defensive intentions. An Infantryman with the 3rd Battalion, 69th Armor Regiment, 1strnArmor Brigade Combat Team, 3rd Infantry Division, provides securityrnwhile his squad moves into their fighting positions while conductingrnbattle drills at Pabrade Training Area, Lithuania, on 2 December 2015. A robust and enduring partnership between American and Polish armies would also yield immediate political dividends. The establishment of a long-term Status of Forces Agreement — along with coalition training andwargames — would unmistakably signal America’s commitment to defending allies in Europe. Representinghighstakesgeo-political brinksmanship, the move would compel Russia to choose between suffering an uncomfortable NATO build-up near their borders, halting, or at least lessening, its interference in Ukraine and elsewhere, or resorting to highly problematicescalatory measures. Were the Russians to cease provocations, the United States could then simply announce aneventual staged withdrawal to reward desirable behavior. Positioning robust and permanent American combined arms forces in Poland would finally capture acute historical significance. For Russians with long memories, Poland represents the pathway that German invaders marched through with panzer corps to nearly annihilate their nation. For Poles who remember the brutality of Nazi and Soviet occupation during the Second World War, resolute reinforcement by the U.S. military would conversely provide strategic reassurance. If the former nation could not abide a robust U.S. Army presence in such emotionally significant territory, the latter democracy would certainly welcome it. Whether pursing the planned rotational system or more substantial and long-term posturing, America must respond to the Russian threat decisively. As famously declared by Supreme Allied Commander of Europe and later President Dwight D. Eisenhower, “the hand of the aggressor is stayed by strength — and strength alone.”7 Russia proved the truth of this axiom in 2014 when it forcefully seized Crimea and continues to prove it as it fosters proxy wars in Ukraine and Syria. Given such belligerence, America should continue Atlantic Resolve but be prepared to complement allied political and economic isolation of Moscow with a larger, permanent, and symbolic military presence in Germany or even near Warsaw. If Russia chooses to destabilize European borders, let them find NATO fighting vehicles and riflemen resolutely overwatching theirs. For the United States and the free world, armored combined arms task forces offer the only message that will deter the aggressor. 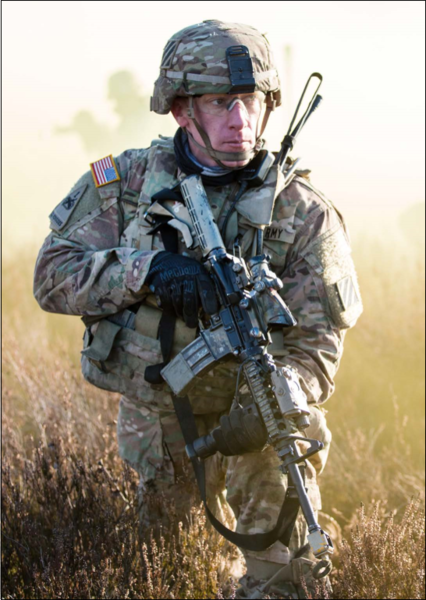 1 TRADOC Pamphlet 525-3-1, The U.S. Army Operating Concept: Win in a Complex World, 31 October 2014, iii. 2 Joe Gould, “U.S. Army Official: Atlantic Resolve May Expand,” Defense News, 4 March 2015. 3 FM 3-90.6, Brigade Combat Team, September 2010, 1-9. 4 TRADOC Pam 525-3-1, 18. 6 H.R. McMaster, “Continuity and Change: The Army Operating Concept and Clear Thinking About Future War,” Military Review, March-April 2015, 14-15. 7 Monument, Eisenhower Hall, U.S. Military Academy at West Point, N.Y. MAJ Nathan Jennings is currently a student at the School of Advanced Military Studies, Fort Leavenworth, Kan. His previous assignments include serving as an assistant professor of history, U.S. Military Academy at West Point, N.Y.; commander of Headquarters and Headquarters Troop and C Troop, 4th Squadron, 9th Cavalry Regiment, 2nd Brigade Combat Team (BCT), 1st Cavalry Division, Fort Hood, Texas and Kirkuk, Iraq; platoon leader, Company B, 1st Battalion, 34th Armored Regiment, 1st BCT, 1st Infantry Division, Fort Riley, Kan. and Baghdad; and 19D Cavalry Scout, 2nd Armored Cavalry Regiment (Light), Fort Polk, La. MAJ Jennings earned a master’s degree in history from the University of Texas at Austin and is the author of the new book, Riding for the Lone Star: Frontier Cavalry and the Texas Way of War, 1822-1865. Editor’s Note: As with all Infantry Magazine articles, the views expressed in this article are those of the author and do not reflect the position of the Department of Defense or any element of it. MAJ Nathan Jennings is currently a student at the School of Advanced Military Studies, Fort Leavenworth, Kan. His previous assignments include serving as an assistant professor of history, U.S. Military Academy at West Point, N.Y.; commander of Headquarters and Headquarters Troop and C Troop, 4th Squadron, 9th Cavalry Regiment, 2nd Brigade Combat Team (BCT), 1st Cavalry Division, Fort Hood, Texas and Kirkuk, Iraq; platoon leader, Company B, 1st Battalion, 34th Armored Regiment, 1st BCT, 1st Infantry Division, Fort Riley, Kan. and Baghdad; and 19D Cavalry Scout, 2nd Armored Cavalry Regiment (Light), Fort Polk, La. MAJ Jennings earned a master’s degree in history from the University of Texas at Austin and is the author of the new book, Riding for the Lone Star: Frontier Cavalry and the Texas Way of War, 1822-1865. Editor’s Note: As with all Infantry Magazine articles, the views expressed in this article are those of the author and do not reflect the position of the Department of Defense or any element of it. This article originally appeared at Infantry Magazine Online.